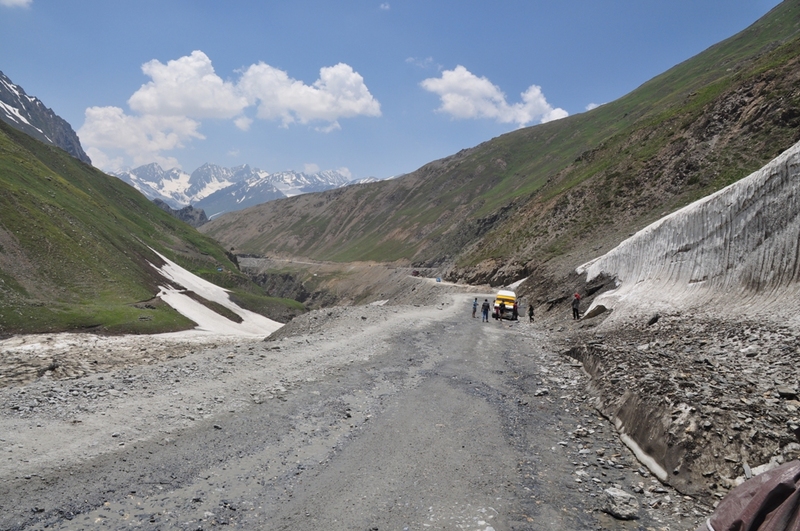 Road Condition – Superb considering we were climbing highest motor able pass on planet. Since all our permits were sorted by the guest house owner at very reasonable commission, hence we had no tension at all. In the morning we had a leisurely breakfast at the Guest house itself. The cook there was actually very good, working 50-50 by splitting time between Goa and Leh. Our typical breakfast @ Guest house included pan cakes, omelets and parathas followed by amazing cuppa of Tea. Farzin wanted to change his Engine oil in the morning since there was lot of leakage and the obvious worry was engine seizing. I also got the air-filter and spark plug changed because my Electra wasn’t giving very optimum performance. 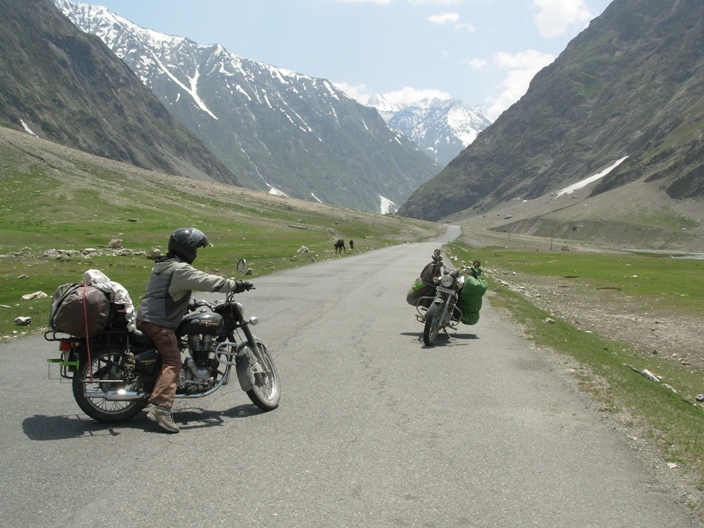 Since our bikes were all fine tuned for Khardung-la we started our ascent for the world highest motor-able pass. I wasn’t keeping very high hopes about the road conditions after my encounter with Zoji-la. Typical climb to Khardung-la top (18380 ft) from leh (11500 ft) takes about 1 hr 30 min to 1 hr 45 min. 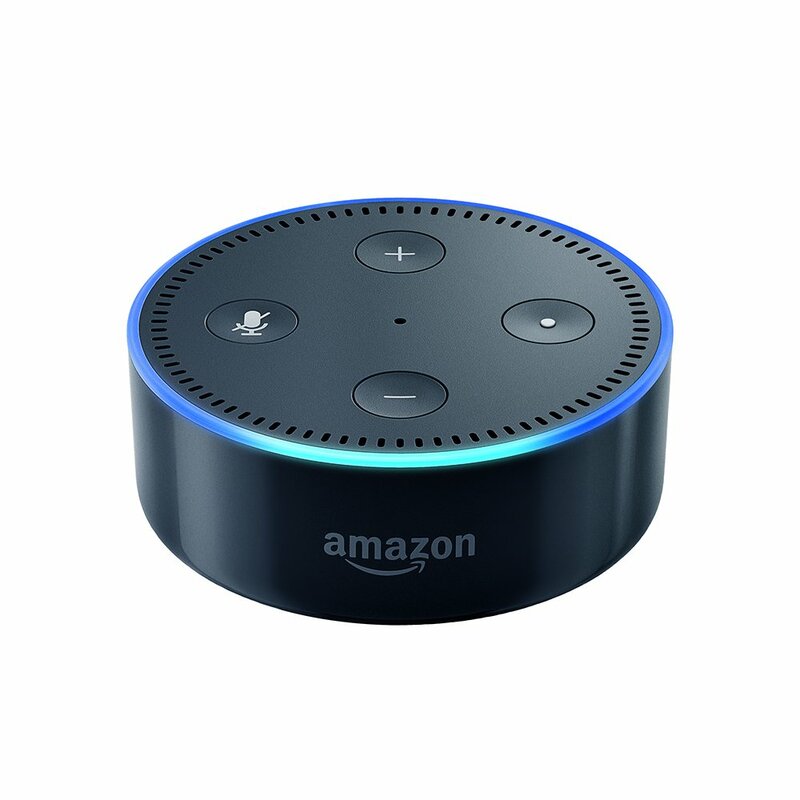 Farzin and I looked at each other and acknowledged that this is going to give a good kick. Farzin hinted to take it slow and try to take some pauses en-route to acclimatize and drink loads of water during the ascent. Considering most of passes have bad roads this one turned out to be an expressway. The number of river streams was like 2-3. Mikhil &Pravin led the route and took some stops for clicking pictures. We made it to the top in little less than 2 hrs and the feeling really was top the world. The view on the top were phenomenal from the highest view point of the region 18380ft. We clicked pictures near the milestones. Farzin complained that he isn’t feeling very great after. It was about 1:30 PM we decided to have the Maggie and black tea @ world highest café which had a whole lot of history behind it. Farzin as usual even though not feeling very well had the most of the Maggie soup. It was already about 45 mins we spent at such an altitude and before AMS starts kicking in we decided to start out descend. We met few cyclist also (mostly foreigners) who took an interesting push-bike decent where (Jeeps takes you up, gravity takes you down. Few of these guys were descending @ >60kmph and I was unable to overtake these cyclists on my Motorbike. That’s what I call thrill of life, just scared with the fact that if you miscalculate your breaking, there is only one way ride down for life. M&P took some shots of these guys and I was going conservative on my fuel as I had already hit reserve mode. I barely had gas left for 25 kms on this low oxygen terrain. The bike started showing signs of missing a thump about 6 kms before Guest house. I slowed down further and farzin tagged along with me to give company. We reached Moon light Guest house @ 4PM and somehow were super tired after just 5 hrs of biking. We all crashed on our beds for a power sleep of 2 hrs. As always I take too much tension so I got up at about 5:30 and decided to leave for Airport road for getting my bike fixed. I went to Tashi mechanic and he tried to fix the missing problem, this time he totally messed up with the carburetor setting. I was now super pissed with the way bike was performing. I had to give in extra throttle to ascend on simple inclines. I tried to venture out on other mechanic on Airport road and all answers were no since it was dawn and there was no electricity. I decided to meet renowned mechanic Mohan again and expressed that I have urgent need (guess all guys that would come to him will have urgency due to tight time schedules we plan). He opened up my spark plug and boom it was dead. The bike was still not picking up after putting in new spark plug. He opened up complete carburetor assembly in the light my mobile phone torch. He changed the fuel intake scale and said this is the reason my sparkplugs are blowing up. 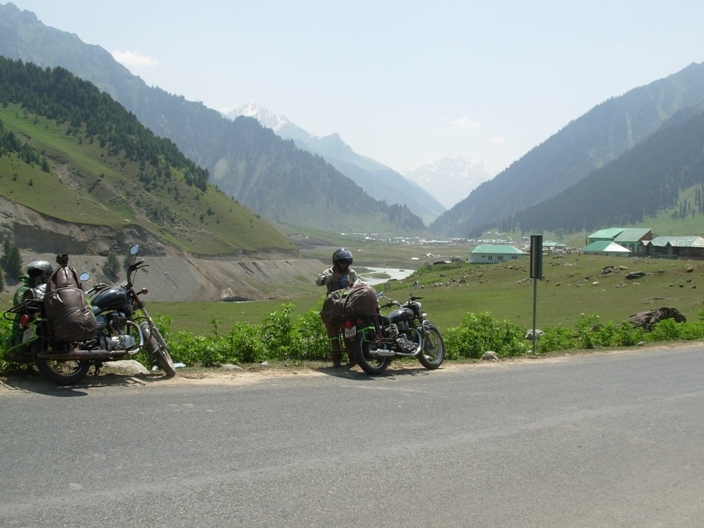 He also suggested that once I reach Manali get the setting to the original setting as this will reduce the fuel intake to engine which corresponds to the oxygen intake at height above 10k. Finally I had a breath of relief and reached guest-house back with a happy mood. Farzin wasn’t feeling very great due to throat infection he had fever. I re-assured Farzin if he isn’t well tomorrow I am okay to spend one more day @ Leh. We had Pizzas for dinner at a nice café in the night and super tried we all crashed down @ 11:00 PM. 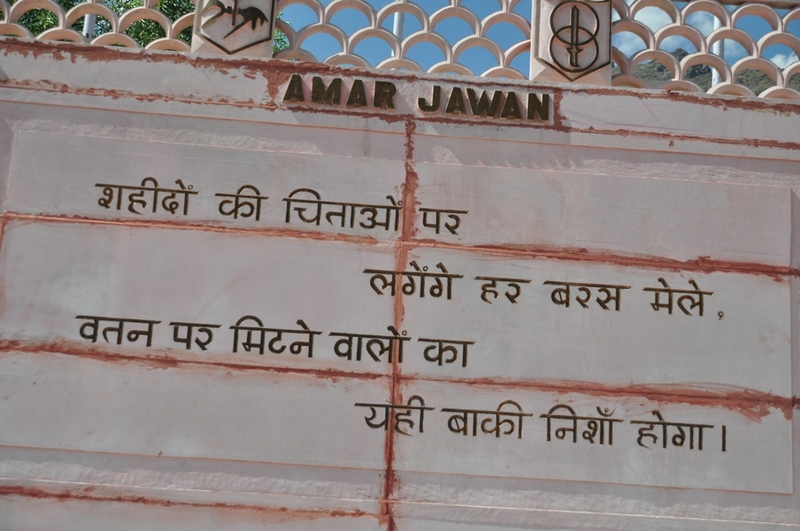 This entry was posted in Bike Ride, Travel Logs, Uncategorized and tagged Bike Ride, Bullet, Ladakh, Royal Enfield, Travel on 18/09/2011 by kamaldeepsingh. 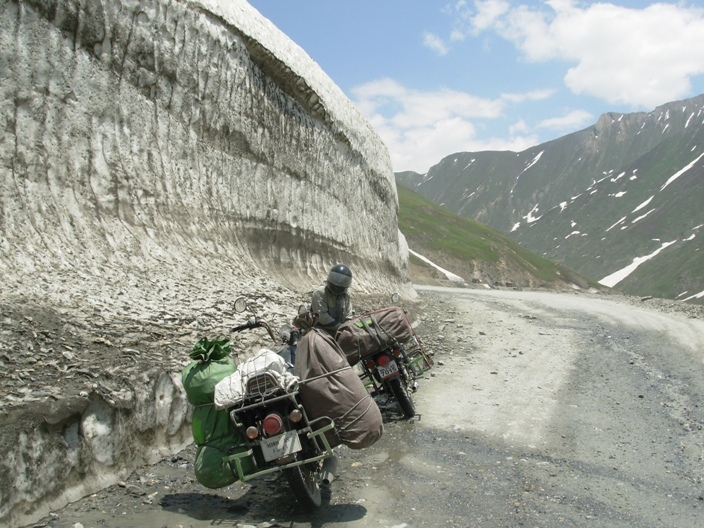 Road Condition – 2+ grade Zanskar Segment on a 8 man Raft. Today was fairly lazy, we got up around 8 AM – considering it was our leisure day. Farzin had very bad throat and high fever and he had been coughing all night. I had to re-confirm with him, if he really wants to do white-water rafting in this situation. He said yes in a very non promising tone, and I understood that he is quite screwed. I tried to convince Farzin let’s not overdo anything – we have a long way to go. He agreed and then said he will medicine and see what happen to which I had to agree. We had a quick breakfast @ our guest house. We reached the meeting point at 9 AM and Farzin bought cough syrup and antibiotics. A Tempo Traveler came at 9:30 and we met a guy named “Prem” of Argentinian origin but settled in Pondicherry with his mother. We also met another Gujju Business group (all of them between 26-28) who are fairly rich and were exploring Leh by SUV. 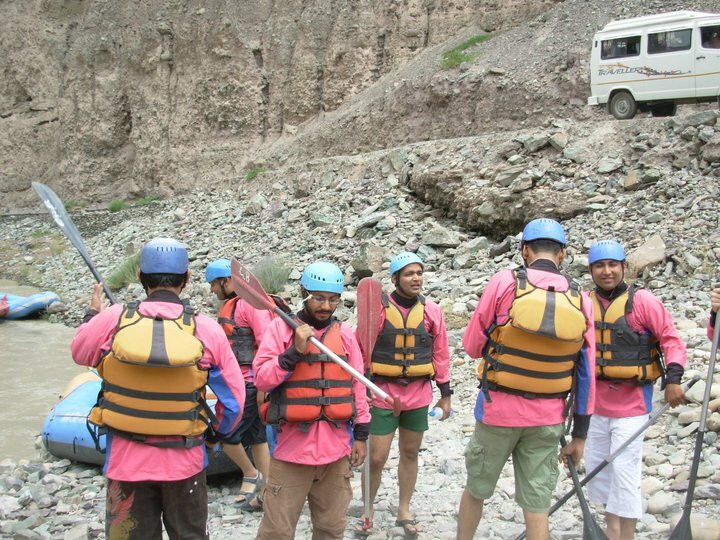 After picking up the Gujju Gang from there posh hote, we started our journey towards Zanskar River. 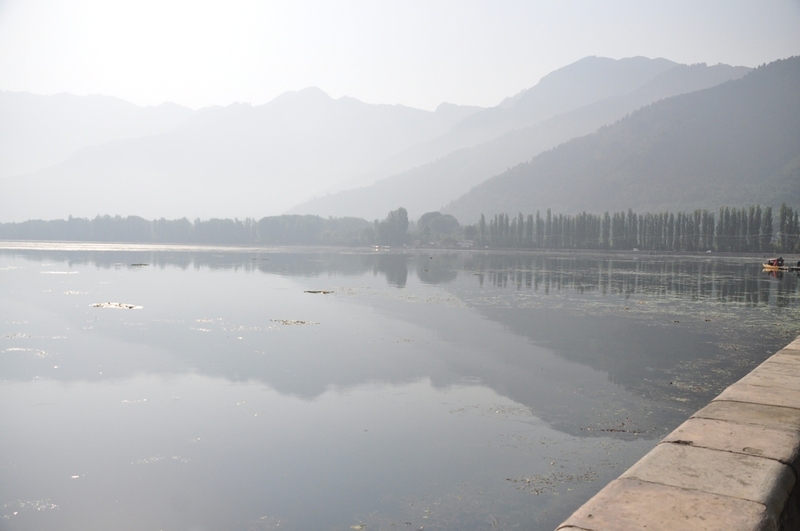 We reached the starting grid at 10:30 AM (1 hr ride from Leh) and walked towards the river for debrief. All Instructors were kind of Pro’s and I felt that we are in very capable in white water. All 5 rafts were now deployed and teams were divided. I and Farzin decided to be the Forwadee (Front Paddlers of the Raft). On our Raft we were 6 members(1 Family inc. Uncle, Aunty and 2 lads around 14-15 yr old) and Ram an experienced raft leader. First thing for me was to check water temperature by putting my bare feet and only 2 words I could spell out (f#*k&nG Cold). After learning the commands and instructions we did a bit of training on steady waters and Ram wasnt very happy with my abilities to be a forwardee on the raft. He got a bit agressive as well, since there was a family along and my best guess was he wasnt expecting much from the family to run the show. I eventually leaned out more of the raft and started to paddle strongly. Farzin and I realized it was not going to be easy 7 km ride. All rafts started to get in white waters and we were the last raft to step in. Wow, it was like a roller coaster ride – we all were screaming and also paddling. After the first shock the instructor got bit frustrated on everyone saying “its my raft and only I give command”. Sh#t this was serious business, I recalled there is a narrow gorge also en-route which passes below a road bridge. The lady (kids mom) wasn’t very interested, seemed like she was dragged in because of adventurous uncle. There were big and small whirlpools, rocks – all in all fairly bumpy ride, on reaching the gorge the leader told this is the toughest section. Have to say everyone was breathing heavy, there were no trees or vegetation for miles. We followed the Ram’s instructions with forwardee paddling first, rear group following the pattern and Ram making sure raft is in right spot at right time. Wow, what a ride. We all were joyous, we continued to paddle while the rest of rapids were fairly of lower grade. 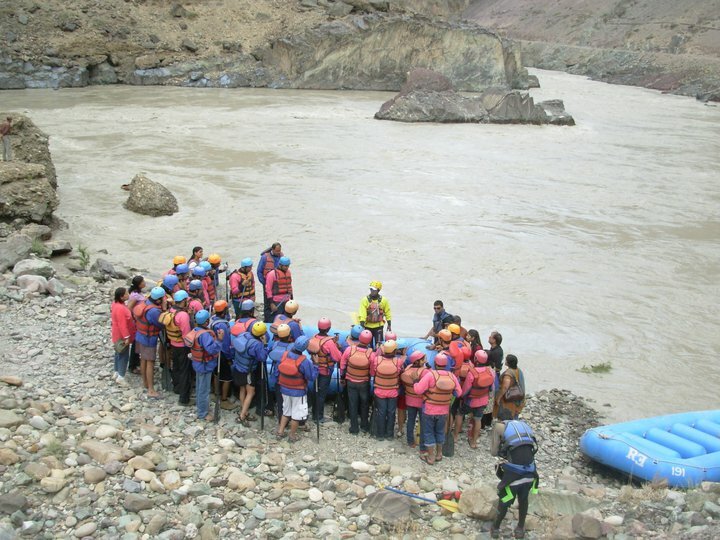 I saw some of members jumping in river from the raft, and I jumped asking farzin to drag me up with the techniques we learnt. Wow – the body was chilled in 5-7 secs to the bones. Heavy weight Farzin easily dragged me up. The guy from Argentina even dared to swim to the shore about 30 odd m swim and was super freezed. We reached the shore and changed in bus which were waiting for us to take back to Leh. Enroute to our surprise there was lunch organized by the tour organizer. We had the much needed lunch and reached Leh back by 3PM dead tired, cold. I decided to doze up and woke up at 6:30 PM. Rest of the day was lazy and we roamed around Leh Market and had food at local cafe to call it a day. This entry was posted in Uncategorized on 18/09/2011 by kamaldeepsingh.